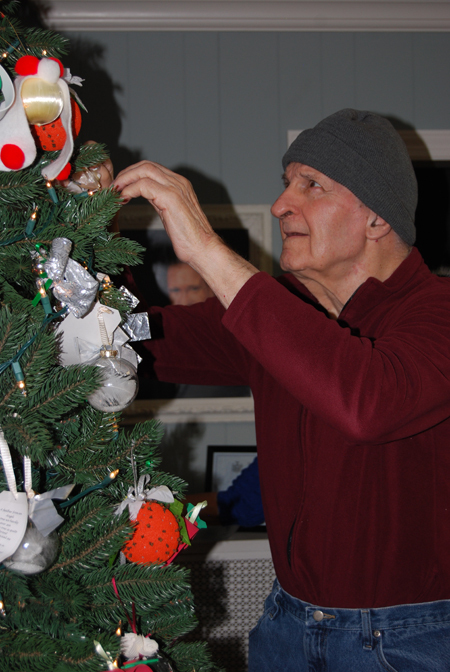 Robert Baumann, one of McPeak's Assisted Living residents, hangs one of the handmade ornaments at McPeak's annual tree trimming ceremony. On December 11, residents at McPeak's Assisted Living celebrated the holidays by trimming the Christmas tree inside the facility's lounge area. As residents took turns decorating the tree, they enjoyed eggnog and cookies, listened to holiday music and sang Christmas carols.